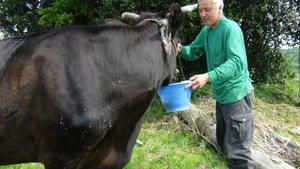 Matsumura attends to the hundreds of abandoned cows. A year after a devastating tsunami ravaged parts of Japan, the town of Tomioka is still under mandatory evacuation. It’s just 10 miles from the Fukushima nuclear plant, well inside the “exclusion zone.” But one man, Naoto Matsumura, refuses to leave. And for one reason: to care for the abandoned animals who have no way out. By all accounts, Tomioka is the apocalypse now: deserted, layered in radioactive dust, buried debris. But the devastation is most evident in Matsumura’s gruesome descriptions of what he’s encountered since — and what he continues to discover. Dogs and cats left to die slowly and agonizingly of starvation. Caged birds with withered feathers. An emaciated cow and her calf, crying weakly in a corner of a barn. 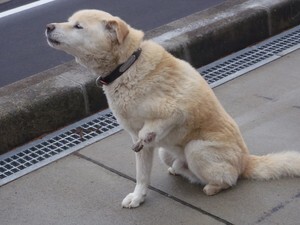 Matsumura rescued this dog from a trap, but was not able to save his leg. The heroism — the absolute selflessness — is almost beyond comprehension. 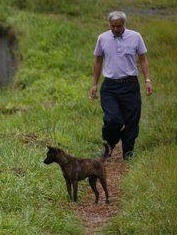 Matsumura lives without human companionship of any kind, without electricity or running water. He leaves the area once in a while, only to buy food for his animals, and then sneaks back in. He is the only hope for the hundreds of cows, pigs, dogs, and cats who remain. The prolonged exposure to such high levels of radiation is almost certainly a death sentence for Matsumura. Tests have revealed his body is “completely contaminated.” But with the government refusing to help, turning away is not an option. For many people who work in animal welfare, success stories are our lifeline. Happy adoptions and news of tougher cruelty laws or random acts of kindness help keep us emotionally afloat. We are often told to focus on the positive — and that’s not bad advice. But for some of us, acknowledging that rage, holding on to that anger and grief, is a big part of the equation too. It keeps us streamlined and dedicated. It keeps us motivated to continue. It keeps us honest with ourselves. Naoto Matsumura, I am deeply moved by your sacrifice and bravery. Thank you for your uncompromising compassion, your integrity, and your honesty. Matsumura’s only companionship are the animals he cares for.